Members enjoy many benefits while helping The Native Plant Center year round. Please join or renew today at a membership level that’s right for you. Fill in and mail or fax the Membership Form. Your support allows The Native Plant Center to continue its work in the education, demonstration, and conservation of native plants. Help make a difference by volunteering for The Native Plant Center. Many opportunities and flexible work times are available. Chances are we need the skills you can offer. The Center is looking for volunteers for gardening, educational outreach, marketing, fundraising, and more. Please call 914-606-7870. At the invitation of Westchester Community College Foundation Board member Jennifer Gruenberg, the land use firm of Divney, Tung, Schwalbe (the latter is a Westchester Community College alumni) chose the college as the recipient of its annual “do-it-in-a-day” landscape project, in which they design and install a garden pro bono for a worthy cause. The targeted site on campus was the front of Gateway, which has now been transformed into an attractive, welcoming entrance with the planting of native shrubs and perennials. Much effort by many parties went into the months of planning and preparation, leading up to planting day on May 16. 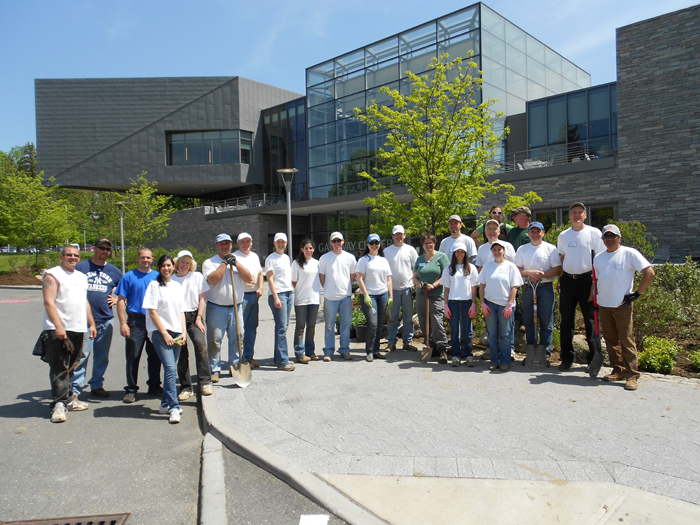 The project was realized with the collaboration, support, and teamwork of Divney, Tung, Schwalbe; Westchester Community College Foundation; Physical Operations; Gateway staff, and The Native Plant Center.